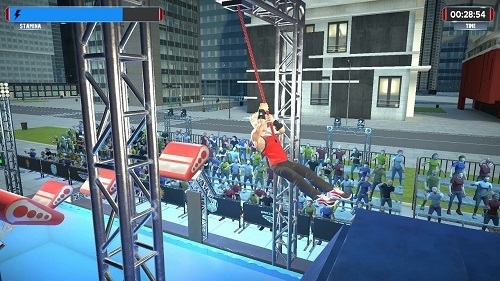 American Ninja Warrior is a long-running obstacle course TV game show, and it’s been very popular. So much so that now there is a video game based on it! Create and train an athlete in career mode, challenge other players, and even design your own obstacle courses. It’s available on nearly all current game consoles, but reviewed on Switch here. The first mode is Quick Play, where a single player or a group of friends can compete with each other and you can design your own courses, which is cool. The announcers from the TV show provide their voices and the obstacles are straight from the show, so it feels pretty authentic. Next is Career Mode. Here you’ll create an athlete to train and compete on the show. You can choose male or female, pick from select names and occupations, and outfit them with clothes and even silly costumes! You’ll then train on certain days before events which increase your stats, and on those event days you’ll compete in obstacle courses. Reach the end in record time to win cash. The last mode is Ranked Matches, where you have one try to make it through obstacles. The gameplay is where the game falters, though. To pass obstacles, you must press buttons at the right time, so the whole game is nothing more than quick time events. You can choose simple or complex controls, but even the simple controls feel off. Even worse, everything in the game cost money, from new obstacles, outfits and accessories, and even the ability to train in Career Mode. So it’s very difficult. Plus the movements are choppy and graphics look like they could be done on consoles from two generations ago. Only die-hard fans of the TV show will enjoy this. If you fall off an obstacle, you just fall in water, so it’s not very violent. If you’re OK with your kids watching the TV show, they’ll be OK with the game. Reading skill is helpful for the menus and instructions, and younger gamers may find it a bit too difficult. American Ninja Warrior Challenge is rated E for Everyone.